HTC One owners holding out for Android 4.4 KitKat will be getting a delayed Christmas gift, with the update set to arrive at the end of January 2014. HTC made the announcement on Twitter, bringing the news that Brits will have to wait until next year for the anticipated upgrade. "We're working with our local carriers to begin the rollout of Android 4.4 and Sense 5.5 for the #HTCOne from end of January 2014," it read. There's currently no word on whether unlocked devices will be getting the update sooner than everyone else. We expect the rest of the world might also get the update at the same time or before, given that HTC One-owning Brits were pretty late to Android 4.3. 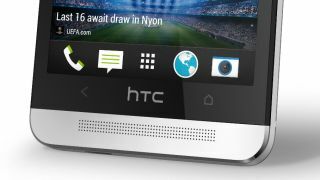 We're chasing up with HTC and will let you know as soon as we hear more. Meanwhile we're expecting the HTC M8 (aka the HTC One Two) to appear around March time, when the current flagship handset will turn One year old. Looking to get yourself a HTC One? Not sure which of the three sizes to go for? We've got the Goldilocks verdict right here.